Greetings, ADs and soccer coaches. The SOIS Sabers host high school varsity and JV soccer matches, boys and girls, at the Kwansei Gakuin Sanda campus field. Thank you for your cooperation as we make use of this nice, though remote, venue. It is easier to travel directly to the KG Sanda campus via school bus or car (with no stop-off at SOIS in Minoh). Scroll down to view photos of the field and facilities, including restrooms, changing rooms, and shower rooms. Scroll to the bottom for food and drink options. Please inform SOIS (2 days in advance) if you will travel in a larger (taller) charter-type bus. (This requires some adjustment at the gate entrance.) Assumption: CA, MBIS, and KIUA will travel in smaller school buses - no adjustment necessary. Please inform SOIS (2 days in advance) of your estimated arrival time. Assumption: 1 hour before game time. 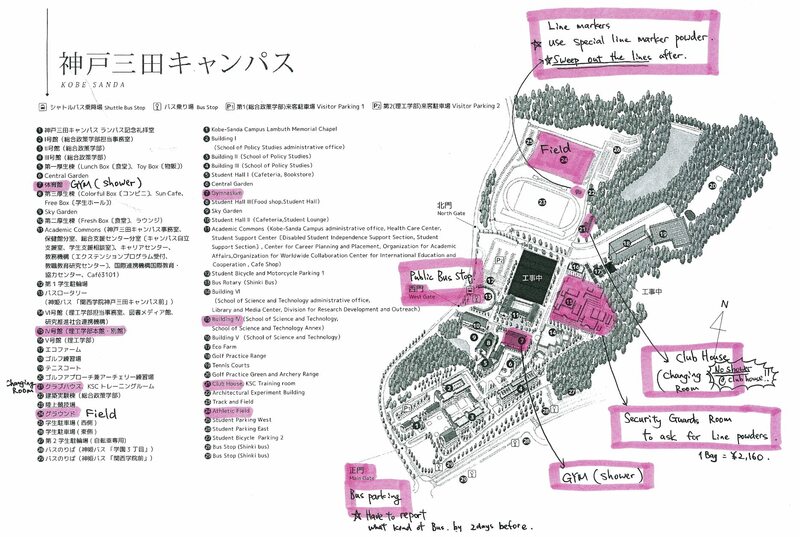 For bus parking, please enter campus via the main gate (正門, seimon; south part of campus), shown at bottom of annotated map 2 above. Bus parking tip: Your driver can drop off your players near the north gate before driving back to the main gate to park - a slightly shorter walk. Car parking: Enter via NORTH gate. Follow red route on this car parking map (soccer field is marked as #29 on this map). Need pass to exit. Car parking tip: You might be able to park in the student parking lot next to the field (#31 on "car parking map", #25 on "campus map 2"). This lot is empty on Saturdays. Public transportation - access via 3 nearby train stations or via an express bus from Sannomiya. JR Shin-Sanda station: 5.8 kms / 15-minute taxi ride to campus. Also, "shinki" bus routes available. Woody-Town-Chuo station: 3.8 kms / 10-minute taxi ride to campus - but no bus from here. Minami-Woody-Town station: 40-minute train ride from Shin-Kobe; no bus from here. From Sannomiya and Shin-Kobe stations: 50-minute "Kwan-Gaku" non-stop express bus to campus. Footwear: Metal spikes are not allowed. Longer hard-plastic spikes for dirt or grass fields may not be suitable for this field, a hard artificial surface covered with a thin sprinkling of sand. Medium-length or short molded plastic cleats or turf shoes are better. Field size: 55 meters wide x 90 meters long. Hard, sandy surface conducive to "carpet burns" - be wary. Warm-up space on the side. Changing rooms: 1st and 2nd floors of nearby clubhouse. No restrooms, showers, or water in this building. Do not leave valuables behind. 2 sets of restrooms: one "outdoor" (100m from field) in front of clubhouse; one "indoor" in gym building (400m from field); both with Western and Japanese-style toilets. Gym building: 400m from field (up stairs; middle of campus) - changing room, showers, water fountains, ice machine. No shoes in gym building, please. Water: Please bring your own, or use tap water from restroom near field, or use water fountains in gym building (400m from field). Drink machines and water fountains on campus. No food allowed on or around the field. Please eat outside the net. Please eat outside the net. One convenience store located opposite campus entrance; 20-minute walk from field. Bring drinks and food with you. No restaurants near the field. "Fresh Box": Friday 11:30-14:00; Saturday closed. set lunches, curry, udon, ramen, etc. food and drink shopping at Family Mart before walking all the way to field. (tel) 079 563 5300 営業時間11:00 - 22:30 Order ONLINE day before. Coaches: Bento lunches, drinks, and snacks provided for coaches. ​Drink machines are located next to field. Water fountains and ice machine are located in the gym, a short walk.